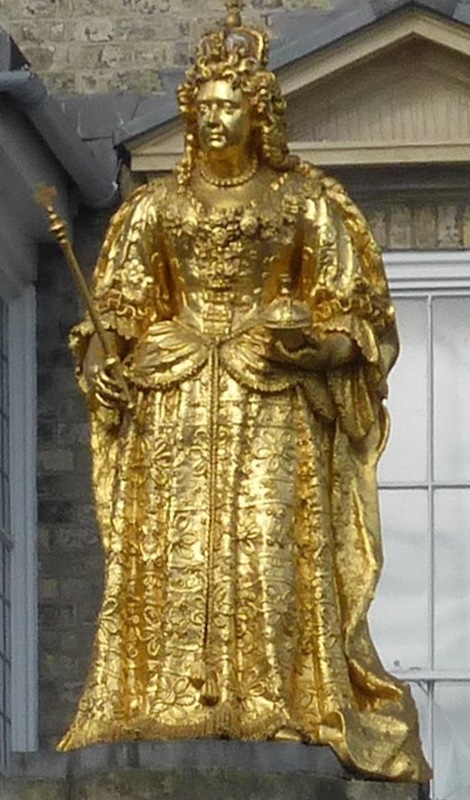 "Queen Anne" has comparatively little to do with Queen Anne. It was the nickname applied to a style which became enormously popular in the 1870s and survived into the early years of this century. "Queen Anne" came with red brick and while-painted sash windows, with curly pedimented gables and delicate brick panels of sunﬂowers, swags, or cherubs, with small window panes, steep roofs, and curving bay windows, with wooden balconies and little fancy oriels jutting out where one would least expect them. It was a kind of architectural cocktail, with a little genuine Queen Anne in it, a little Dutch, a little Flemish, a squeeze of Robert Adam, a generous dash of Wren, and a touch of François Ier. It combined all these elements and a number of others into a mixture that had a strong character of its own — particularly when they were mixed with skill and gaiety, as they very often were. — Mark Girouard, Sweetness and Light, 1.
of the Market House, Kingston-upon-Thames, Surrey. Mark Girouard takes the first part of his title from Matthew Arnold's famous advice to the middle classes in Culture and Anarchy (1869), to cultivate their sensibilities through an appreciation of beauty in all its forms, and seek enlightenment for themselves and others. Arnold's aspirational readers would be the very ones to buy into a whole new (or new-old) style of architecture, promoted in the 1870s by architects who had moved on from the Gothic, and were now looking to the vernacular for their inspiration. Among them were a whole generation of important figures, including Richard Norman Shaw (1831-1912), John James Stevenson (1831-1908), Philip Webb (1831-1915), Edward William Godwin (1833-1886) and William Eden Nesfield (1835-1888), many of whom were designing new homes of this type in the best parts of London, and in its newly accessible and more salubrious outskirts, either for themselves or for clients. This essay will look at some of the elements of the style that Girouard describes, as seen in a few later Victorian — and now much sought-after — family homes. 1. A "little genuine Queen Anne"
The upper storey of a late-Victorian house in Walton-on-Thames, Surrey. Tile hanging first appeared in south-eastern England towards the end of the 17th century to provide weather protection for the thin panels of wattle and daub used for the walls, especially in exposed situations, and often on the upper storeys only. It is therefore sometimes known as weather-tiling. When clay roofing tiles became cheap and easily available they were adopted as a cladding panel over timber-framed walls more generally. This would take us into the reign of Queen Anne (1702-1714). 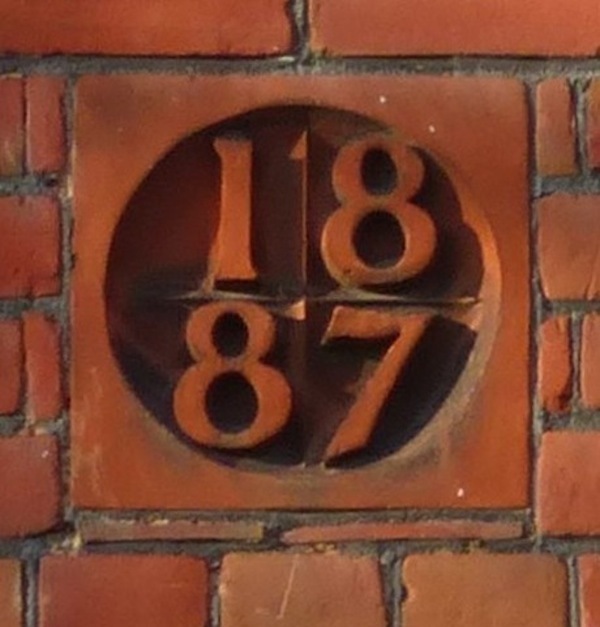 Although tile-hung houses can be found anywhere now, they were originally more popular in the home counties, especially in the Weald of Kent, Sussex and Surrey: John Newman describes this as the "the region par excellence for tile-hanging" (28). As it happened, Shaw's first private commission was "to make tile-hung and plastered additions to an old Kent farmhouse" (Girouard, The Victorian Country House, 46). He went on to employ tile-hanging to the extent that "pretty tile-hung houses" became "the mind's-eye image of the Norman-Shaw house" (Nairn and Pevsner 68, 69). 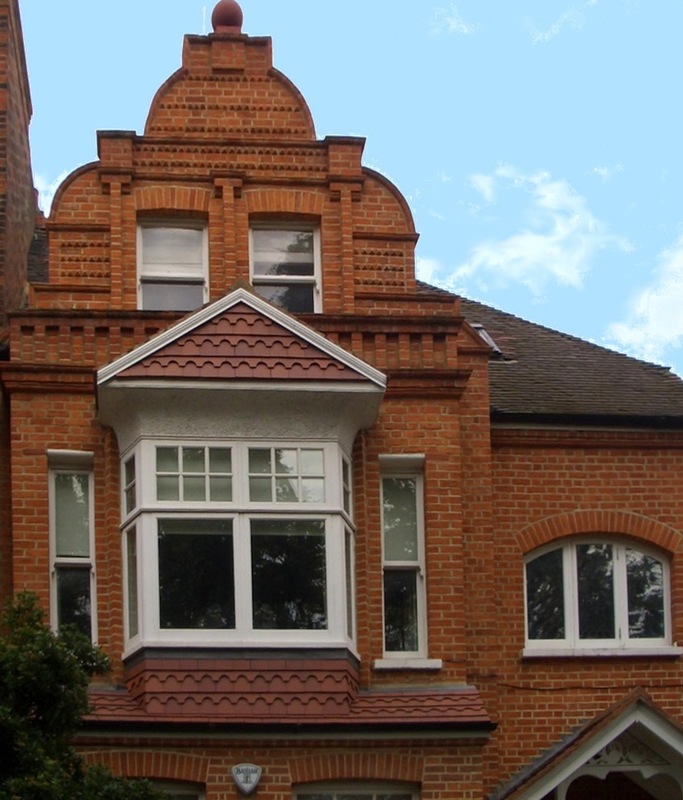 Dutch gable in Norman Shaw/Norman Shaw-inspired Bedford Park, with ornate brickwork and also hung-tiling, both above and below the oriel. Here was another new (or rather, new-old) element of the Queen Anne Revival style. Dutch gables had also been popular from the seventeenth century (an influential example was Kew Palace of c.1631). If anything, Dutch gables were more fashionable here at that time than in the Netherlands themselves, and there are still a number of them around. Looking at houses in one part of Kent from this period, local historian Gordon Taylor found that "[e]xactly 50% of the properties outside of the towns in East Kent have Dutch gables added to older buildings that were mostly timber framed (2). Unsurprisingly then, these too were associated with the Queen Anne Revival, and indeed, when Norman Shaw, J. J. Stevenson and others built houses in London in the later Victorian era, they were chiefly characterised by such gables: "Pont Street Dutch" was the name applied to the style in one part of Knightsbridge. They were also prevalent in the houses of Bedford Park, like the one show on the left above. 3. "[S]mall window panes, bay windows, with wooden balconies" etc. Fenestration and joinery of late-Victorian houses in a road in Walton-on-Thames, Surrey. Left to right: A canopied bay with small panes. (b) A wooden balcony to a second floor. (c) A porch with columns and joinery. There were various experiments in the houses of this era, some using Shaw's favourite motif of "a bay with curved returns, a semi-circular centre light, and lead glazing bars" (Turnor 101), as at his Swan House in Chelsea, and others making a play on it, like the one on the left above, with a canopy and undulating transoms. 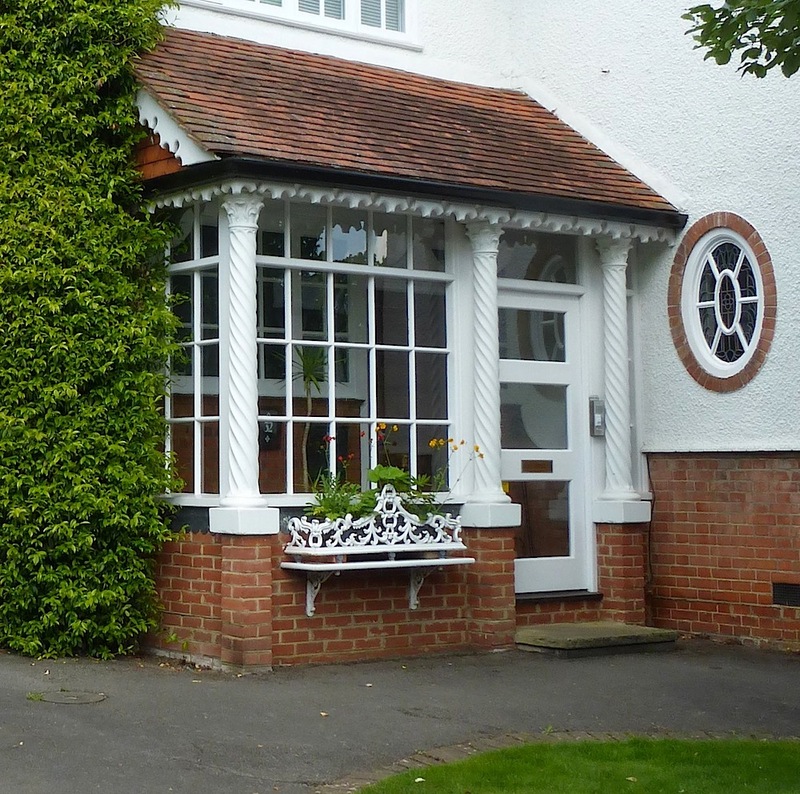 As at Bedford Park, balconies, picked out in white paint, are much in evidence in such houses in Surrey, and porches tend to be spacious and decorative. 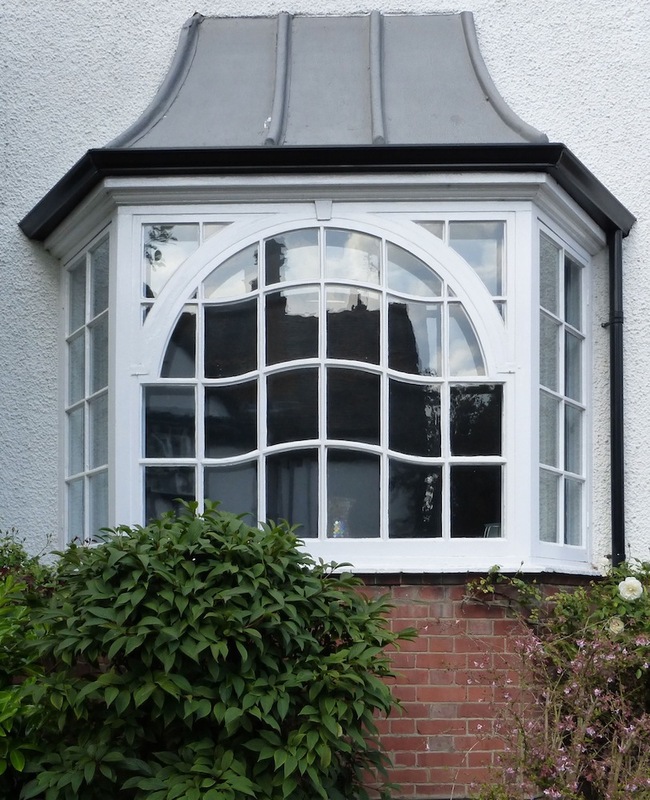 The round window next to the one shown here is filled with stained glass, another feature which is often found in door-panes, in a fanlight over a front door, or in the top lights of other windows. The upper storey of a house in Weybridge, Surrey. Hung tiling itself could enliven and vary the upper level, in gables and angles where it sometimes repeats patterns on the roofing. It was in the Victorian period that the more decorative fish-scale tiles were more commonly used. 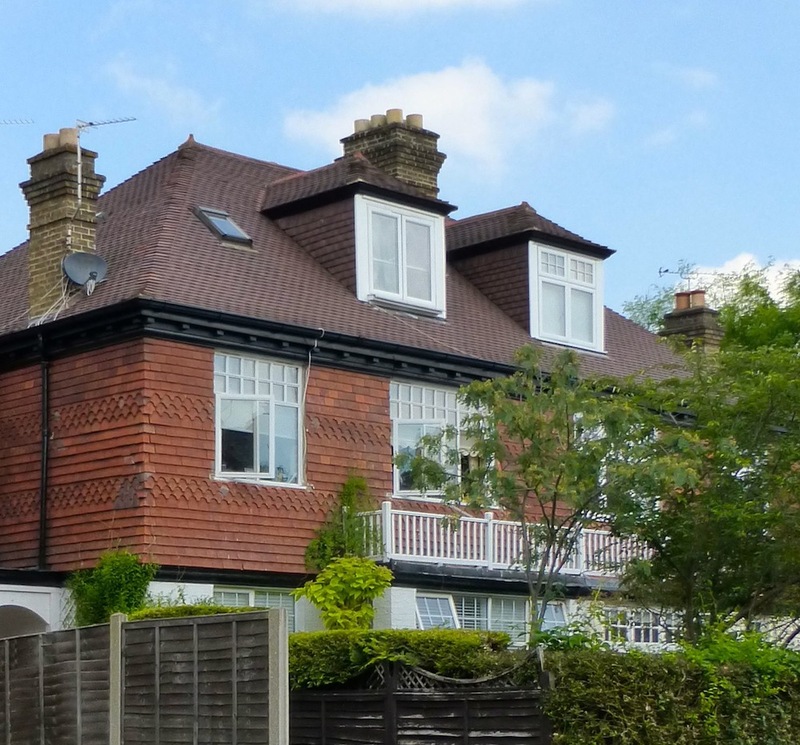 Another good example is the house that Shaw built in 1885 for Kate Greenaway in Hampstead, at 39 Frognal. The house shown immediately above dates from just two years later. 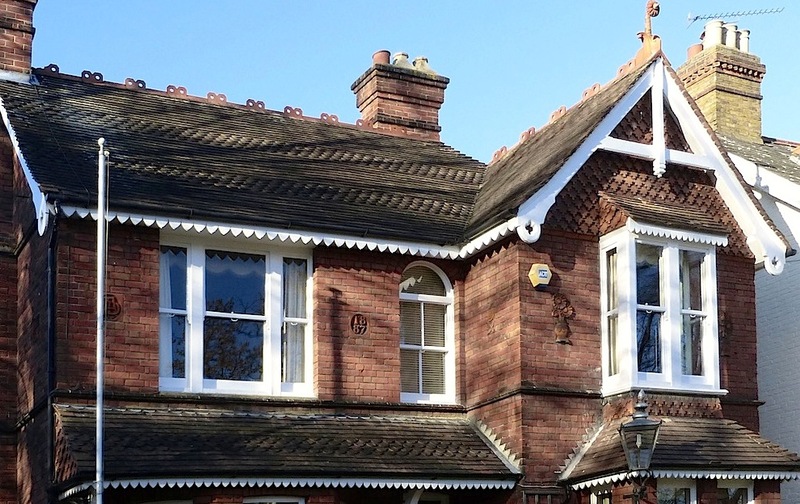 Bargeboards, ironwork, finials and prominent chimney-slabs also gave scope for personalising a house. Details of the house shown immediately above. Left to right: (a) The date. (b) A sunflower motif. 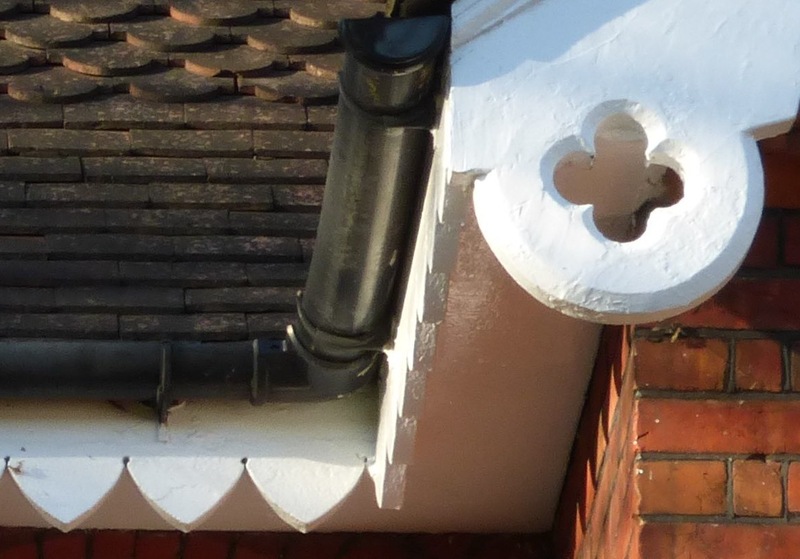 (c) White joinery, including the pierced quatrefoil at the end of the bargeboard. However, what makes it really easy to identify a house of this period (and distinguish it from a well-preserved seventeenth-century one, or a more recent take on one) is the "cocktail" of embellishments. 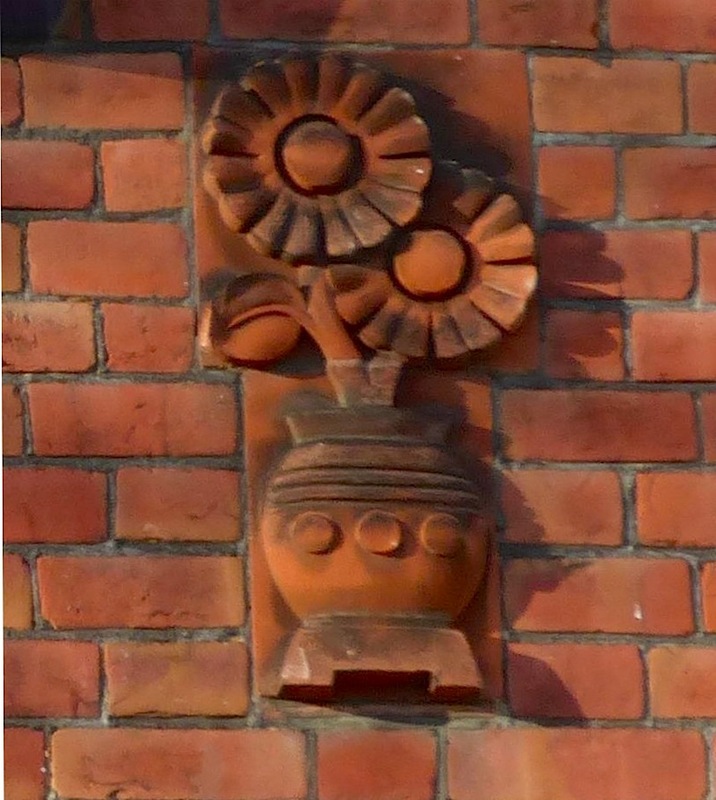 Even without the proudly vaunted date, the vase of sunflowers in terracotta marks this house out as a Queen Anne Revival project of the Arts and Crafts period: notice, in the larger picture, that even the gable finial is a sunflower. The pierced quatrefoil is interesting too, reminding us that many of these "Queen Anne" architects had worked in the Gothic idiom at one time. Yet another kind of embellishment was pargeting, that is, surface decoration of the plaster or render on the house's façade, as in this house (shown on the right) in Walton-on-Thames, Surrey. 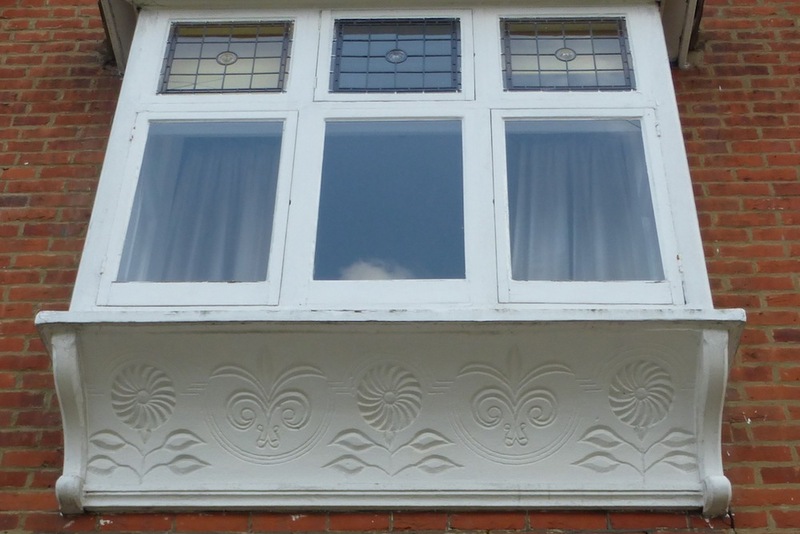 This was a craft that had been particularly popular in the seventeenth century: Tim Buxbaum tells us that the "high point" of pargeting had been around 1660, and that it could be richly exuberant. 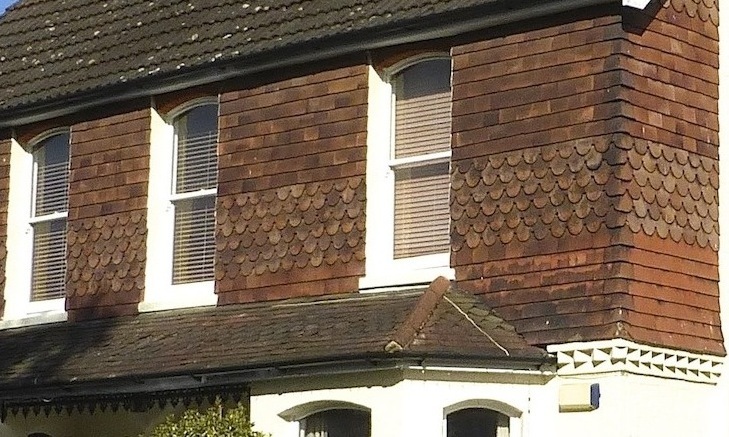 Now this craft was revived as well, with some whole rows of late Victorian houses in Surrey sporting patterns like the one shown here, especially over or under top-storey windows. But, as Buxbaum points out, it was "more controlled, precise and scholarly, better suited to more regular buildings." Some elements of the so-called "Queen Anne Revival" may have had fairly local origins, but in the end these various features spread far beyond the home counties. "Shaw's style was of course imitated by nearly everybody in the 1880s and 90s," says John Newman (117). Kate Greenaway wrote to a friend, for example, about her new home in Hampstead, "There was a horrid man drawing the outside [of the house] all day. So I suppose he is cribbing Mr. Shaw's design, and going to put my house up somewhere else, who knows where" (qtd. in Speilmann 143). That is just the kind of thing that happened: from being the preserve of special clients, the Queen Anne house, generally minus the more elaborate gables, became the "final style of the Victorian speculative house" (Dixon and Muthesius 65). There must be something comfortable and comforting about it, because it continues to be both favoured and copied to this very day. Photographs, text and formatting by Jacqueline Banerjee. You may use these images without prior permission for any scholarly or educational purpose as long as you (1) credit the photographer and (2) link your document to this URL in a web document or cite the Victorian Web in a print one. Click on the images to enlarge them. Buxbaum, Tim. "Pargeting." www.building conservation.com. Web. 26 May 2017. Girouard, Mark. Sweetness and Light: The Queen Anne Movement, 1860-1900. New Haven and London, Yale University Press, 1977. _____. The Victorian Country House. Oxford: Clarendon, 1971. Nairn, Ian, and Nikolaus Pevsner. Surrey. Buildings of England series. 2nd ed. revised by Bridget Cherry. London: Penguin, 1971. Newman, John. North East and East Kent. Buildings of England series. 3rd ed. London: Penguin, 1983. Rickards, Stephen. "Vertical Tile Hanging." www.building conservation.com. Web. 26 May 2017. Spielmann, M. H., and G. S. Layard. Kate Greenaway. London: Adam and Charles Black, 1905. Internet Archive. Contributed by New York Public Library. Web. 26 May 2017. Taylor, Gordon. "Dutch Gables in Kent." Kent Archeological Society Quarterly Newsletter. Summer 2012. No. 93. 2-3. Web. 26 May 2017. Turnor, Reginald. Nineteenth Century Architecture in Brtitain. London: Batsford, 1950. "Weybridge (Monument Green) Conservation Area Character Appraisal & Management Proposals." Downloaded from Weybridge Conservation Areas. Elmbridge Borough Council. Web. 26 May 2017.